An enterprise quality management software system (EQMS) can help companies systematize and streamline quality control practices so that they are able to get superior products to market quickly while observing compliance requirements. We at HOYA Service provides our custmers with MasterControl™, an EQMS implementation and validation service,software, based on our extensive experience as an user. 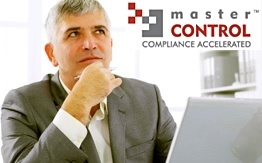 MasterControl ™ is a global standard for integrated QMS software, which reduce risk of audit nonconformities and product recalls,adopted worldwide including FDA (U.S. Food and Drug Administration). With our own extensive experience utilizing this powerful product, HOYA Service will provide you with the real EQMS that is indispesable for your business. The design change process is not clearly defined. Difficult to track and manage the root cause detection, due to a lack of the Customer Complaint management process. Complicated process and incomplete recording of quality training. 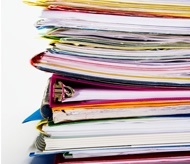 Incomplete revision control with paper documents. Needs compliance with digital signature regulations such as ER/ES, Part 11, etc. By visualizing cumbersome business processes and clearly organizing them, it is possible to operate the PDCA cycle of quality management stably. Our solution supports the design of optimum business process by making full use of the experience in the medical device industry and strongly supports smooth operation by digitizing the process utilizing MasterControl ™. You will be able to accurately perform everyday tasks such as document version control and change control, planning and management of training, and management of quality events such as customer complaints. Through extensive experience in this field, we accumulate numerous best practices. With our numerous templates and frameworks compliant with international standards such as FDA, ICH, IMDRF, ISO, as well as domestic regulation, disappear your concerns about inspections, audits and compliance. For each of the elements that make up the QMS, such as the items described in the complaint report and the approval route at the time of document change, each company has its own detailed requirement. Since MasterControl ™ has a very flexible structure to respond to various request, you can utilize it without major change in your business process. In addition, since the operation is intuitively understandable, you can easily change the settings by yourself. The highly extensible interface of MasterControl ™ makes it easy to cooperate with other systems. We can build smooth seamless comprehensive QMS with peripheral systems such as ERP, PDM, MES. More companies are going global every day, operating sites in numerous countries and doing business in multiple languages. MasterControl now offers its world renowned document and quality management solution in nine languages: English, French, German, Japanese, Chinese (Simplified and Traditional), Korean, Italian, Portuguese, and Spanish. The fact that MasterControl ™ is adopted by FDA's Office of Regulatory Affairs (ORA) brings a great sense of security, especially to customers who place importance on transactions in the United States. 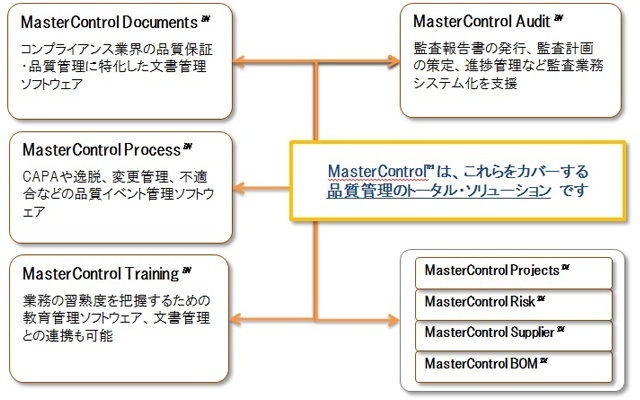 The basic system configuration of MasterControl ™ is shown in the figure right. (Please contact us for more details regarding hardware/software requirements/recommendations and others.). For the database server, you can use Microsoft SQL Server®. You can utilize our solution as a Cloud Service. For details, please contact us directly. MasterControl ™ consists of multiple modules that can operate independently. As you can select and install only necessary items from these modules, you can cover only the target tasks without waste. The following three implementation patterns are recommended. If you wish to add a new module after the first system implementation, it will not become a big issue. If you implemented applying one of the above patterns, the work for additional implementation can be minimized. The average duration of the implementation project is about 4 to 6 months in any of the above patterns. We have contributed to various customers based on our extensive experience and achievements both as a EQMS user and a service provider. Items that are particularly strong are as follows. Engineers are familiar with the life science industry / business. It has been cultivated by responding to various requests at HOYA which is a medical device manufacture, and other customers which is pharma industry. We will realize the system that is suitable for your daily business operation. We clarify the business flow, user and system usage, and implement the system by fully considering usability and flexibility as well as training and support. We can provide with support and consultation on globalization and overseas rollout, through our know-how cultivated by supporting 110 oversea companies in 38 countries. We provide high quality services by improving quality by adopting International Development Guidelines (CMMI) for the system implementation process and ITIL for the operation support process.